World Wrestling Entertainment (WWE) has a history of doing strange things and not taking itself completely seriously. 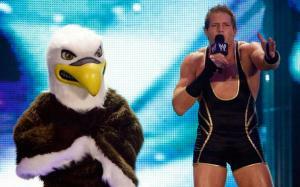 Now one wrestler, Jack Swagger has got himself a mascot: Swaggers Soaring Eagle. Not a fan of pro wrestling, but I heard from TVTropes that Chikara used to have a lot of funny animals among their wrestlers. Like Dragon Dragon, Colt CaBunny and CP Munk, U. S. Ape and MosCOW. There are so many jokes I could make about this I don't know where to start. I would so love to see fursuit wrestling..